Two murder mysteries to review today... it's all I seem to be reading at the moment, not that I see that as a 'bad' thing. 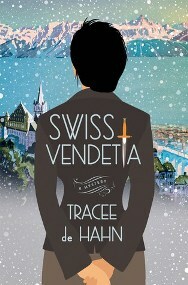 First up, Swiss Vendetta by Tracee de Hahn. Agnes Luthi is an inspector with the Swiss police, but she has dual nationality, she's actually American who was born in Switzerland. She's just changed departments within the police, moving from financial crime to violent crimes. She's the sole parent of three boys as her husband has recently died. The storm of the century is almost upon Lausanne when the police get a call to say that a body's been found in the grounds of a local chateau. Agnes only just manages to get to the place before the storm hits and the group of police officers who made it with her are to be cut off for several days while they investigate the murder of Felicity Cowell, who worked for a London auction house. The Vallotton family who own the chateau are a very old, traditional Swiss family and are not giving very much away. Agnes has her work cut out to solve this one, not only because of the family but the elements are also very much against her. I was ever so slightly underwhelmed by this. The first half of the book was really slow and I might have given up if I hadn't been reading it for a couple of challenges. As it was it did improve, more began to happen, and I did become interested in the case. But I still found the characters a little bit flat. There's a back story that concerns how Agnes's husband died and why, I found this distracting to be honest, although the truth when it came out was a surprise. The setting for the book was excellent and there is a strong feeling of Switzerland in a snowstorm and the aftermath - that I very much liked. All in all, this book was a bit hit and miss for me but that's OK, it's impossible to love everything. Swiss Vendetta is my 5th. book for the What's in a Name reading challenge and covers the category, 'A Nationality'. It's also my 7th. book for The European Reading challenge, covering the country of Switzerland. Next, Wash this Blood Clean from my Hand by Fred Vargas, book six in the Commissaire Adamsberg series. No one on Adamsberg's team has any idea that he had a brother, Raphael. Years ago the brother was the main suspect in the murder of a young woman in the village in the Pyrenees where the family lived. The murder weapon had been some kind of trident, a fork for digging, and Adamsberg has, over the years since this happened, done some digging of his own, convinced as he was that his brother was innocent. His conclusion was that a serial killer is on the loose and that it is a famous judge who lived in the village. He comes to think of the killer as The Trident. No one, of course believes him - the judge is well respected - and when the judge dies that seems to be the end of that for fifteen years. Until Adamsberg spots a murder in the paper, a woman killed in exactly the same way as all the others. But the judge is dead... Various members of the team are off to Quebec on a DNA course. Adamsberg can forget about his dead serial killer while over there can't he? Well no, of course he can't. Oh my goodness, how can Fred Vargas possibly manage to maintain the quality of this series like she does? This was so complicated, so many layers going on, the historical case or cases, the DNA course, Adamsberg's personal life interfering with those two things - his own stupidty, which is a bit mind boggling to be honest. You want to give him a shake at times. The Quebec setting is beautifully done, the cultural differences between the local Quebecois and their counterparts from Paris was beautifully illustrated and very funny. Every single character is so real, all with their different quirks and habits and failings. I love Clémentine and her friend Josette, the eighty year old computer hacker. Hilarious. I've loved every single book in this series and hate the thought that eventually I'll finish them all and have to wait for a new book to be written. Wash This Blood Clean From My Hand is my first book for the 12th. Annual Canadian Book challenge which is being hosted by The Indextrious Reader. Cath, I met Tracee de Hahn at a mystery conference and this book is her first I believe. She was quite interesting to talk to and listen to on a panel. Her husband is Swiss and so her knowledge of the country (think they might have lived there for a while) is authentic. I haven't read this book yet, but I keep meaning to. Reminding myself that I will try it next year. 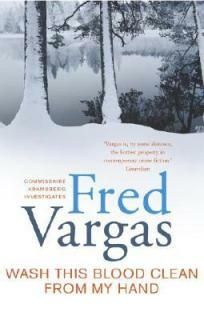 Pat: Yep, I have a handful of real favourites and Fred Vargas is one (others are Louise Penny and Elly Griffiths). I try to spread their books out but am rapidly getting throught them all. Kay: Oh, how interesting that you met Tracee de Hahn. Yes, I saw that she does actually live in Switzerland which is why the setting in the book is very strong I think. Good luck with it when you get to it. I just visited Fred Vargas's Wikipedia page. Wow--so many fascinating accomplishments! Which one of her Commisaire …. woops?? should I read first. Do you happen to know which one is the first in the series? I'm very interested because of your keen interest in the series. It sounds like it's right up my alley. Not sure about Swiss Vendetta, although it seems to have it good points, and it is hard to find a book for Switzerland. I do have to get back to the Fred Vargas series. So many good books and authors, I cannot keep up. How are you getting on with A Discovery of Witches? I started it this week for book group and I liked the Oxford setting, the Bodleian library and all the academia, but then I got to the second chapter where the vampire starts to climb the building and wondered whether it's going to be some kind of Twilight thing which isn't really my cup of tea. Not giving up yet though! Judith, yes Fred Vargas is one talented individual. Yes, I think the first book is called, The Chalk Circle Man. I don't remember a lot about that one if I'm honest but subsequent books, read over the last couple of years, have been excellent. Tracy: I can't, in all conscience, recommend Swiss Vendetta, but it was a good book to read for Switzerland, though I'm sure there must be others... I haven't looked. Nicola: I did finish A Discovery of Witches, my review is among my reviews for October. It was 'OK'... no more than that. I'll be honest, I'm not at all sure it'll be your kind of thing.